In his detailed study, Stefan Luginbuehl critically examines the latest efforts to establish a common European and EU patent litigation system and suggests possible alternatives to such a system. Due to the lack of a European patent court, both the EPO and national judges interpret European patents and European patent law. This results in diverging interpretation across Europe and costly litigation for patent holders. Stefan Luginbuehl's proposals to promote the goal of a uniform interpretation of patent law and ease the difficulties are timely and highly insightful. 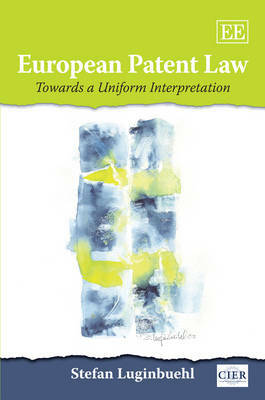 Dealing with important legal and political issues related to European patent litigation and the establishment of a common patent litigation system, this book will appeal to practitioners, patent litigators, patent attorneys and judges specialised in patent litigation. Academics teaching and learning IP (patent law), private international law, or international civil procedure, will find this study interesting as the book deals with important aspects of national and international patent litigation, as well as procedural and structural questions related to the establishment of a patent court for Europe.